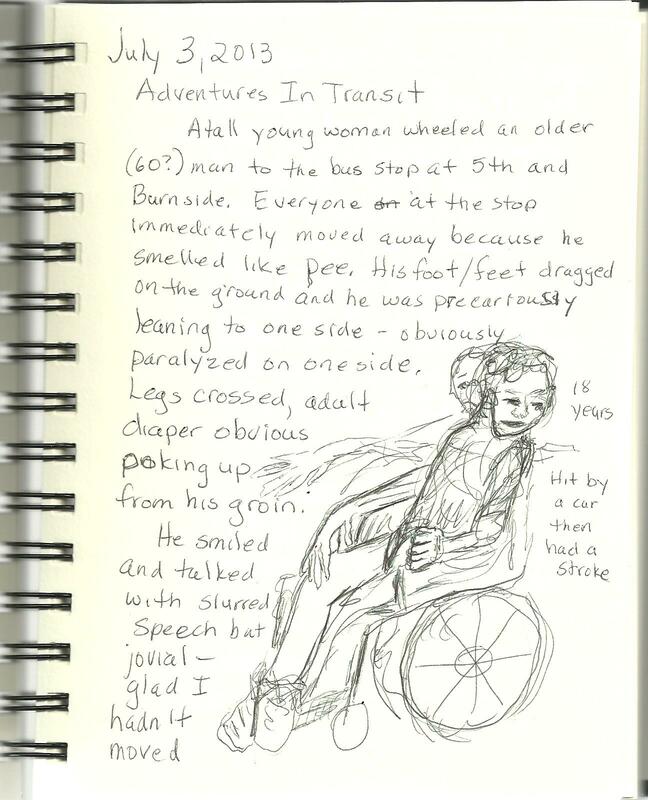 I have been writing little vignettes and stories for years now about my encounters using public transportation and on not driving in a car crazy society. I keep thinking I should put them into some sort of collection but haven’t exactly figured out the best way to do it. 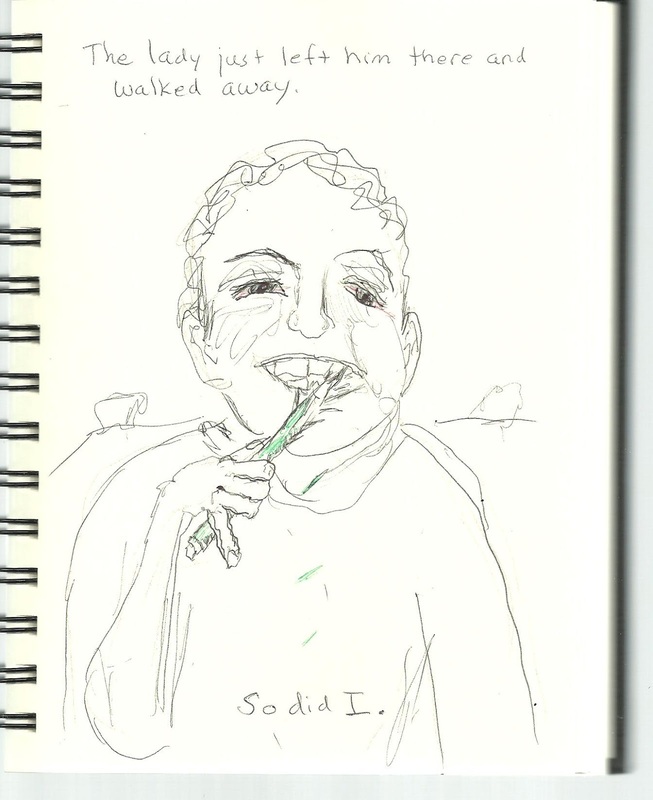 Yesterday I bought a new smaller size sketchbook/journal and my first entry was about an absurd and troubling encounter at the bus stop. 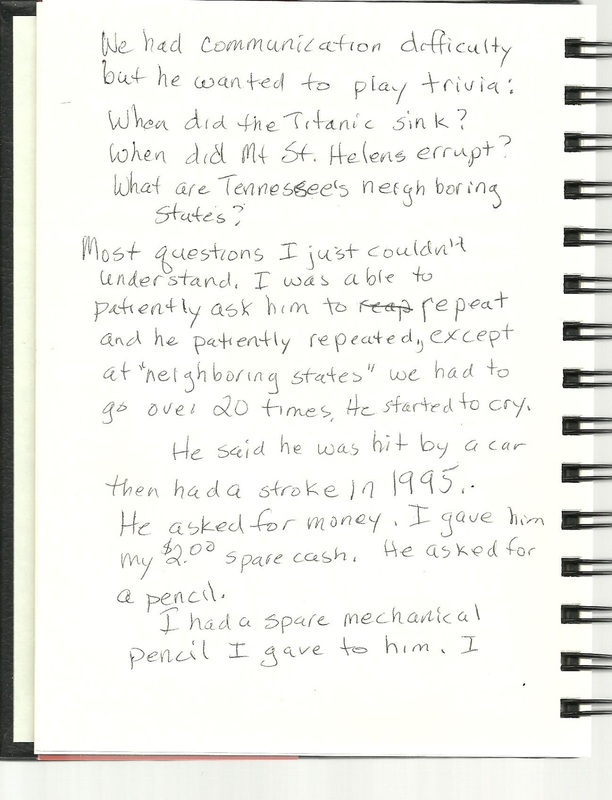 My on-the-road sketches are very sloppy and rough, but a friend suggested I just start posting my journal pages as they are and not worrying so much if they’re good enough. 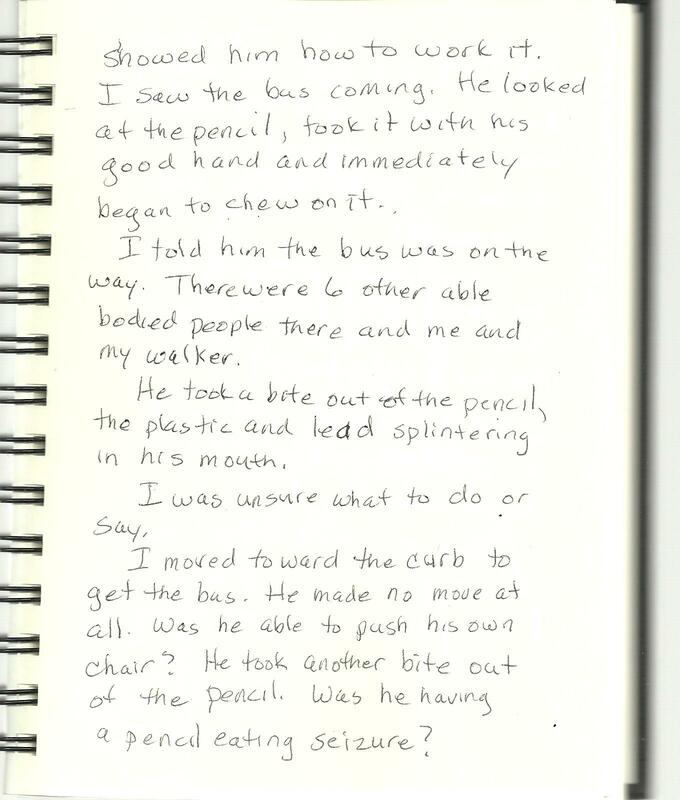 So here is a raw Adventure in Transit called THE PENCIL MAN. I’m not sure I like the smaller pages — my usual journal is 8.5 x 11. I’ll see how this goes. If you’d like to read more polished adventures in transit, you can find The Little Madonnas here, and Driving home here. Any comments are appreciated and thanks for stopping by. I got a chance to tell my story about Iris and Aurora yesterday at the Disability Arts and Culture Program’s fundraiser for the Inclusive Arts Vibe dance program here in Portland, Oregon. 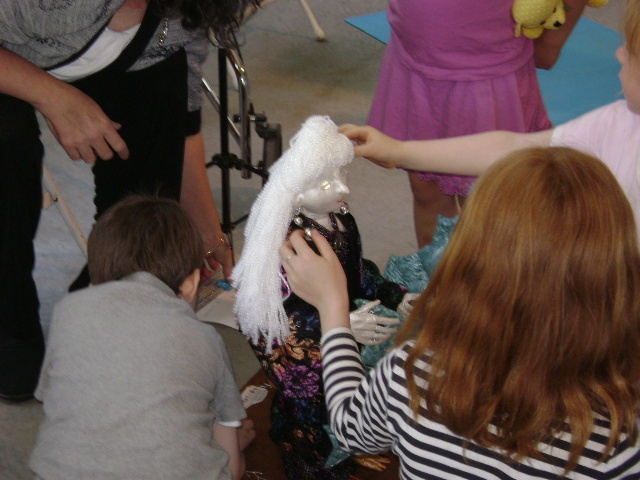 While there weren’t as many children there as I had hoped, it was fun sharing the story and my fabric sculpture with everyone there. I made this for a Somewhat Secret Place Art show a few years ago. 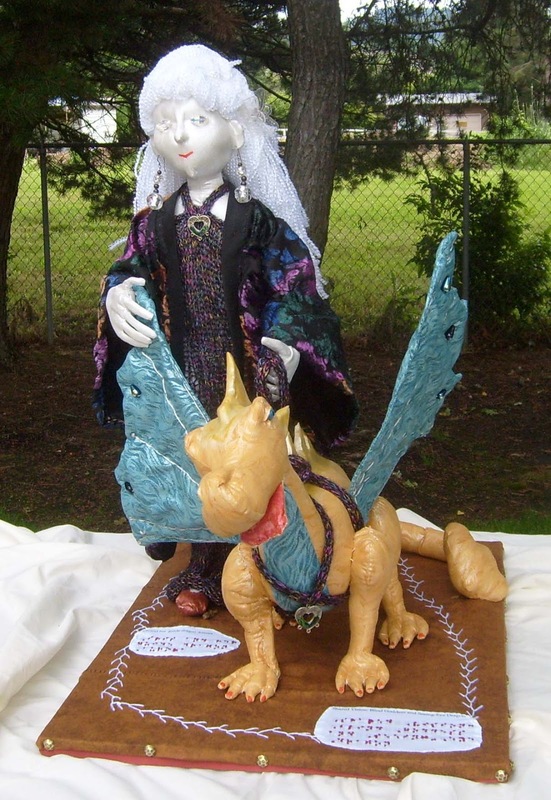 I made this particular sculpture very tactile and I embroidered braille tags on it naming the piece, Shared Vision, and Iris, a blind goddess and her seeing-eye dragon. 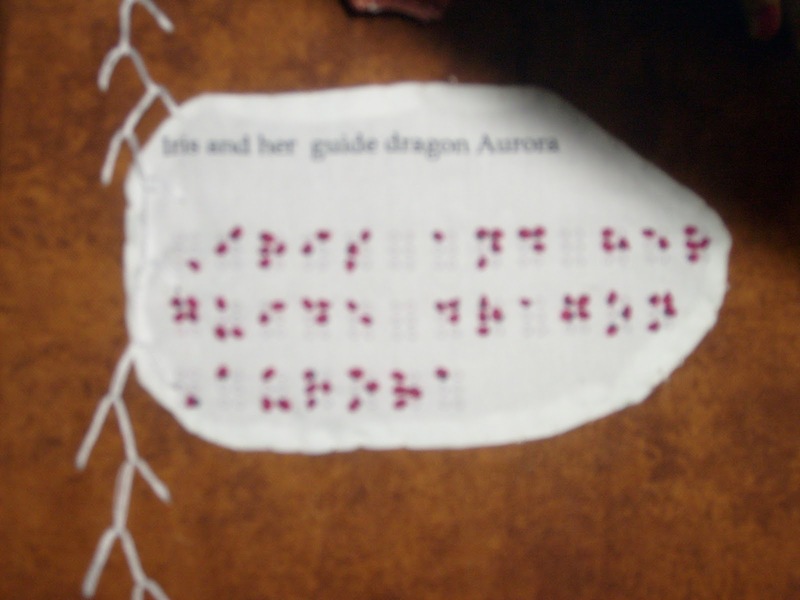 I have this dream of one day getting the story published in both type and braille with raised relief illustrations, but only time and luck and a lot of haggling would make that happen. Meanwhile, I decided to just share it here. For one thing, it’s much too long for a standard picture book but I like the length. It’s a nice meandering fairytale. 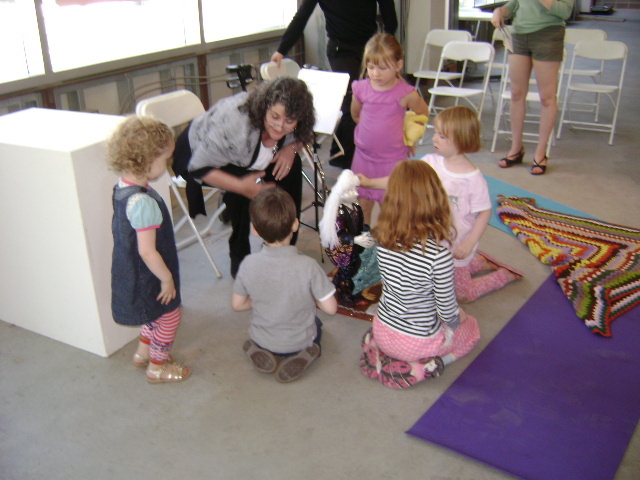 So here are some pictures of the art and children enjoying petting the dragon and learning about braille. And here is the story. Please feel free to share and retell this story, but give me proper credit. I have a copyright on the story, but a story not shared is no fun. Long ago and far away, when there were still a few dragons flying around, there lived a young couple named Zelda and Zachariah. Zelda was a medicine woman for her village, and Zachariah grew the plants and herbs to make the medicine. They were very much in love, and more than anything they wanted to have a child. Soon enough, they were blessed with the birth of a baby girl. She was the most amazing baby they had ever seen, with creamy skin and snowy hair. Her eyes were clear as crystals that danced and sparkled and delighted Zelda and Zachariah. They named their daughter Iris after the goddess of the rainbow. Their neighbors didn’t like that baby at all. She was strange looking. And it was obvious she couldn’t see with those weird eyes. That baby was blind. There had never been a person who was blind in the village. Everyone in the village was practically perfect. The village itself was practically perfect. It was nestled in a valley surrounded by fertile fields, lush forests, a clear river and majestic mountains. The land provided everything they needed. Everyone ate well and was healthy. And if they got sick, the medicine woman could fix them right up. But now that she had the strange child, they began to not trust her. If she really knew how to make people healthy, why did she have a blind daughter? Mayor Bighair stopped buying her hair tonic. It made Zelda and Zachariah very sad. They didn’t want to leave their beautiful village, but they didn’t want their daughter to grow up with people saying bad things about her. Zelda told everyone she and Zachariah were taking the baby to visit her cousin in a village on the other side of the mountains. They were gone for a long time. Then one morning, the villagers smelled the aroma of good medicine coming from Zelda’s chimney and saw Zachariah tending his garden. Mayor Bighair visited the couple and saw no signs of the baby. “You did the right thing. A child like that is better off with those kind of people,” Mayor Bighair said. He bought his hair tonic and told the villagers they could once again see Zelda for their sicknesses Things went on like they did before. Except Zelda and Zachariah hadn’t taken Iris away, but had made a room for her in their basement. She slept during the day and played at night. They were sure the day would come when the people in their village would be more understanding; until then, they would protect their precious daughter. Iris was a happy and helpful child. When she was old enough, her mother taught her all about herbs and how to be a medicine woman. They both worked on medicines to make Iris see, but she never did. They also worked on medicines to make the villagers kinder, but that didn’t work either. But Iris learned how many footsteps it took to get anywhere in the house. She was a whiz at math. She helped her father keep the accounts and plan his most productive garden ever. Iris and her mother made pots with images of all the different herbs carved on them so Iris could find the right herb by touching the pot. Iris showed her mother how to arrange the mixing bowls, mortars, herbs, and utensils so everything was in easy reach. Things went well until one day, a plague of fiery red dragons nested in the mountain forest above the village. The villagers could hear the dragons’ terrible roars and see their hot fire breath billowing into the sky. The villagers knew those dragons were up there scheming to burn the village and eat them. A beautiful young woman with pearly skin and crystal eyes wearing a long dark cloak stepped into the crowd. Zelda and Zachariah ran toward her. The villagers figured out pretty quickly that this young woman was the baby Zelda and Zachariah said they sent away many years ago. “I’ll be happy to go. I am not afraid,” she said. The villagers did, although they were pretty sure she wouldn’t take care of the dragons — the dragons would have her for supper. Maybe that would give them enough time to pack their belongings and run. As soon as Iris stepped into the forest, she felt around on the ground until she found a long stick. She used it to find her way along the mountain path. It was not the first time she had been there. Often while her mother and father were asleep, she sneaked out to explore the village and the forest beyond. She counted her steps and followed sounds and smells to find her way around. She loved the sweet air of the forest, the rough texture of tree bark, and the cool touch of the leaves and grass. Now she followed smell of sulfur and smoke and made her way to the edge of the dragons’ lair. She took a deep breath and almost gagged it smelled so awful. She listened to the roars and grumblings but didn’t hear as much as she expected. She estimated it was only one dragon family – a father, a mother, and a small one. Iris took a small cauldron out from under her cloak. She gathered leaves and dried sticks and made a fire. She poured water from a canteen and herbs from a small pouch into the cauldron. Soon it was bubbling and filling the air with a sweet minty smell. The dragons went quiet. They sniffed the air and looked around for what was making that wonderful aroma. The dragons saw a girl hidden in the trees. She was the most unusual looking person they’d ever seen, but whatever she was cooking smelled delicious. The dragons were stunned. People always ran when they blew fire—or attacked them with swords and spears. Before she could finish, the little dragon flew up and slurped up the whole spoonful. “No, Aurora, No!” the dragons roared. “It tastes better than it smells.” Instead of falling over from poisoning, the little dragon did a double back flip and looked healthier than she had in a long time. The dragons drank the entire cauldron and licked it clean. The smoke stopped coming out of their mouths. They were no longer red. They were golden with beautiful blue wings. “Eat people! Nasty!” said Aurora. “It gives us gas,” said Aurora. “I’ll take you there,” Aurora said, and she let Iris hold on to her wing and walked with her to the river. Iris was afraid to get in the water, but the little dragon splashed and played with her until they were both good and clean. 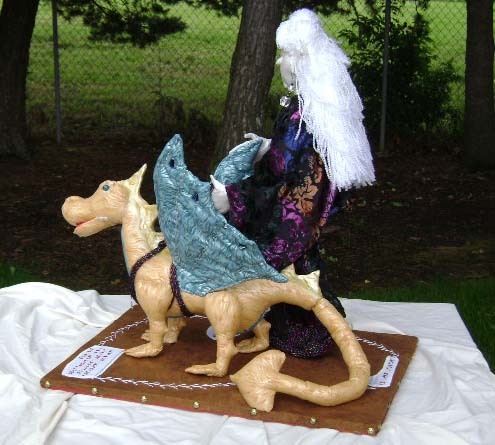 The dragons flew Iris back to the village, but nobody was there. “They must be hiding,” Iris said. “They’re afraid of you.” She called out, “It’s okay! They don’t eat people.” Nobody came out. Iris took them to her house. Only Aurora was small enough to follow her through the door. Iris’s parents trembled in the kitchen. Zelda hugged Iris, and Zachariah tried to chase Aurora out. “Dragon flower?” her mother asked. He talked on and on. Iris whispered something in Aurora’s ear and Aurora flew up and snatched at his hair which came off in one grab. It was a wig! Mayor Bighair’s face and bald head turned bright red, and he ran out of the city and was never seen again. A few other villagers left, too, but most stayed and found out their village was even more perfect than before. If they had dragons in the village, they knew they would always be safe. Zachariah planted a big field of dragon fruit so the dragons always had plenty to eat. Iris never had to hide again. Anywhere she wanted to go, all she had to do was call for Aurora and she would be her guide. Sometimes Aurora would fly Iris to strange new lands. And if ever people they met were afraid, they would show them that a dragon is not such a scary thing, once you see it clearly. This is a story I wrote and told at December storytelling events for the last two years. I hope you enjoy it and always get what you wish for. When I was 10 years old, I only wanted on simple thing for Christmas: a Schwinn sting ray bike with a banana seat and high riser handle bars. I had been so good, at least, since Thanksgiving. I did all my chores with minimum complaint. I shared a room with my brother and sister, so I wasn’t about to keep the whole thing clean, but my bed was made and my toys were put away. My parents gave every indication that Santa would bring me a bike. On Christmas Eve, I was so excited that Mom had to give me two pieces of fruit cake to get me to go to bed. Now, the fruitcake in our family was not that dry little brick you find in the grocery store this time of year. 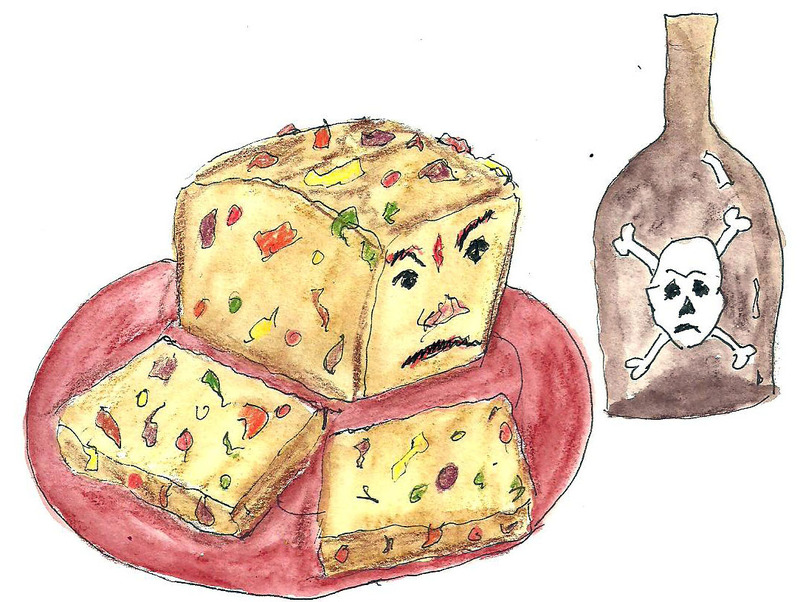 Our fruitcake was an old family recipe that had been refined and perfected by generations of alcoholics – each year a little more rum and sugar was added to the recipe. By the time it got to my generation, it was dense moist slice of heaven. Just opening the tin that it came in was an intoxicating experience. I loved it. It was filled with chewy sweet fruits and nuts. It made me warm and happy, and calmed me down enough to go to sleep. I woke up in the middle of the night thirsty and needing to pee. When I finished my business, I heard my parents on the back porch laughing and talking. It was a sweet sound to hear. They had been fighting so much lately, mostly about money. I peeked around the doorway to see what they were doing. 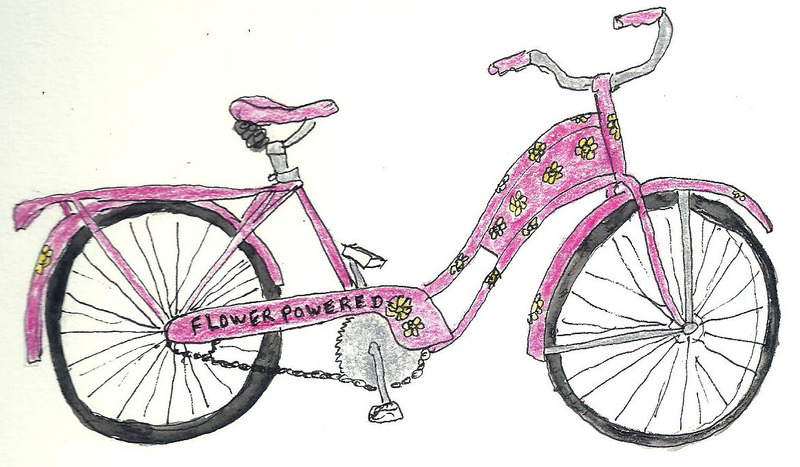 They were painting an old used 1950s clunker bike pink with yellow daisies. I was crushed. I wanted to run into the room and yell that they got the wrong bike, but they were so happy, I just couldn’t. I trudged back to bed but didn’t sleep well. When my sister and brother got up, they had to drag me out of bed, which never happened before on Christmas morning. My mom was so happy about the bike. The yellow daisies she painted on it were small and out of style. She’d painted “Flower Powered” on the chain guard, but it didn’t have the right kind of mod over-sized flowers of the 70s. Nothing shined or glittered. It looked like the kind of bike she would ride. I pretended to like it. I pretended to like the other gifts, too, but in our family, you had one big gift and the rest were just necessities wrapped up – pajamas, socks, underwear. For Christmas breakfast we got to have anything we wanted. I wanted fruitcake. As I ate, I began to get a little hot and flushed. I started thinking about how hard I’d worked and how good I’d been only to wind up with that awful bike. My sister never made her bed and she got her easy bake oven. My brother threw a major fit every time he had to take out the trash, but he got his GI Joe with the kung-fu grip. They were both eager to go outside and brag about their gifts. They had on their coats and were out the door while I was downing one more piece of fruit cake. My mom asked if I wanted her to help me carry the bike out. I said no and put on my coat. “I hate that crappy bike!” I yelled. “It’s an old ladies bike!” And I ran out the door. The girl in the neighborhood who was closest to my age was Sissy Manjialardi. Her father was actually able to keep a job and she had all kinds of great toys and cool clothes. And what was she showing off to all the neighborhood kids? A brand-new, fire-red Stingray with a gold banana seat, and high rise handle bars with glitter streamers. She rode it down deadman’s hill, half a block from my house. It wasn’t really that dangerous, it was more like a rise in the road and she stayed on the sidewalk. None of us were allowed to ride in the street. She would speed down the hill, and fly off the curb and do this quick turn and brake and skid sideways on the asphalt leaving a mark on the asphalt. Then she would let one of us neighborhood kids take turns pushing the sacred bike back up the hill so she could ride it down again. I stood in line with the rest, but when my turn came, instead of waiting for her to mosey up the hill with her friends, I jumped on the bike. I flew down deadman’s hill. After all, in a fair world, the bike would be mine. Besides, I knew I was cooler than her. I knew I could do that skid thing way better than she could. What I didn’t know is how wide those handlebars were. They got caught on the street sign. The bike stopped and bucked and I flew over the handlebars out into the street, skidded across the asphalt, and skinned my hands and face. Sissy and the other kids screamed and ran over to the bike to make sure it wasn’t hurt. Sissy said that no one would ever be allowed to touch her bike again and she took it home. I lay there dazed waiting for the other kids to beat me up – kid justice is swift and direct. I started crying like a big baby, and I thought I probably deserved a good pounding. She whisked me home and cleaned my wounds, which turned out to be minor. Later she and I went for a bike ride together. She rode my dad’s bike, because, as it turned out, the bike was hers, painted up for me. And that very day, my mom taught me how to ride in the street. She said I was old enough and since I was so hard headed, I was probably going to do it anyway. She showed me the hand singles and how to look all the way back before going around a parked car. She made me promise to be careful. And I was. And it turned out to be a great bike for me. I liked to wander, but no matter how far I went or how rocky the road was, that bike held up and brought me back home. And that next Christmas, I did NOT have fruitcake for breakfast.